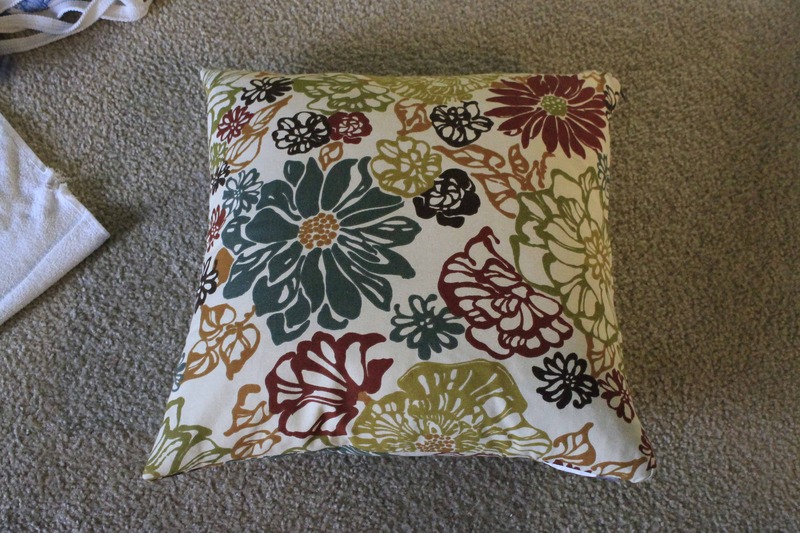 No Sew Pillow Cover - With Piping! 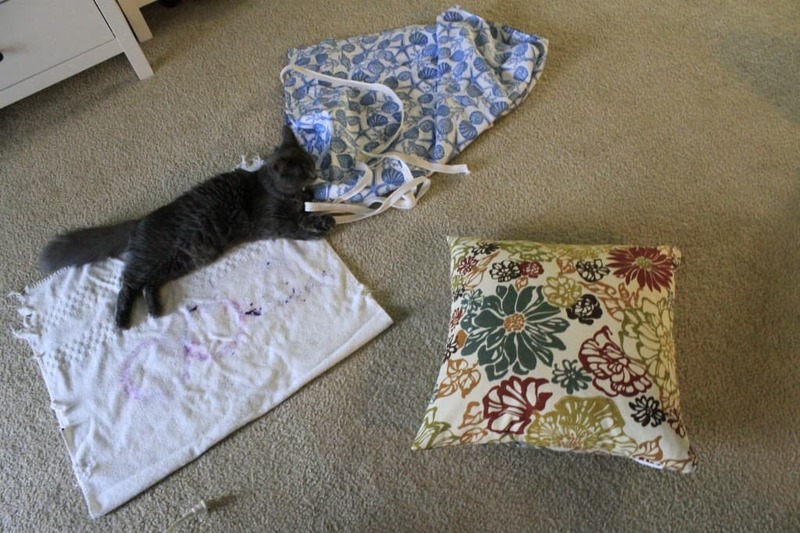 You are here: Home / Home / Home Projects / No Sew Pillow Cover – With Piping! 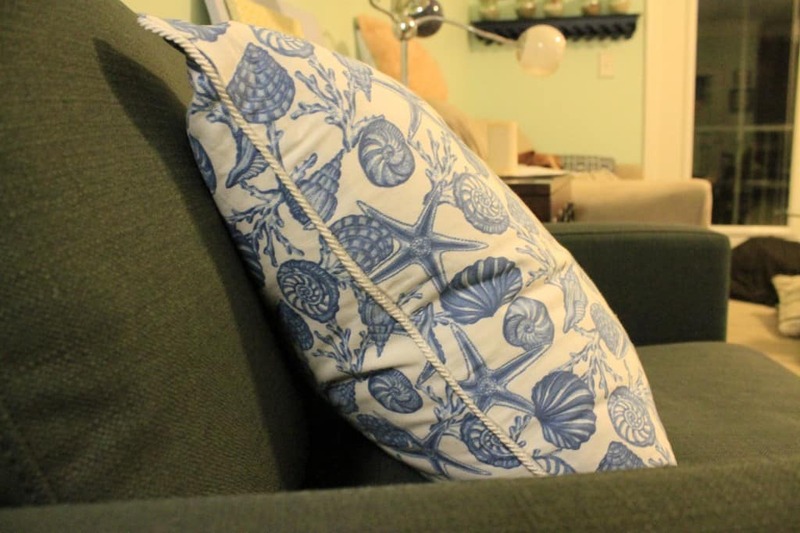 No Sew Pillow Cover – With Piping! 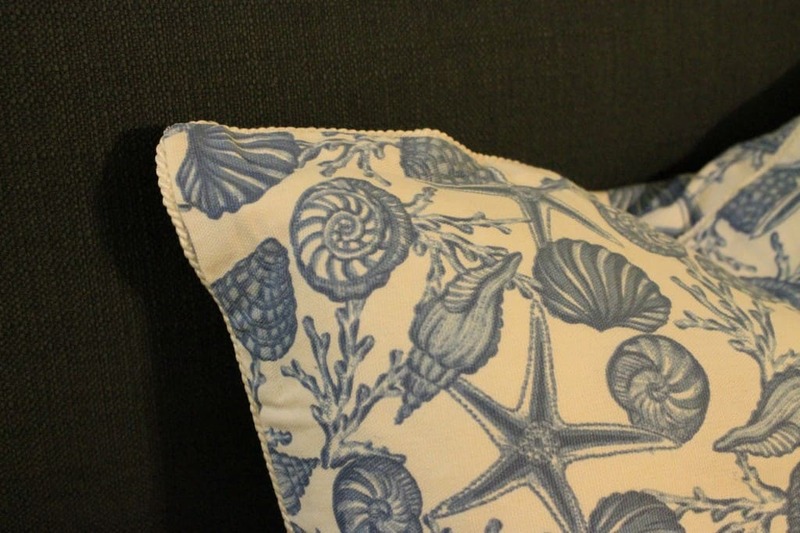 Y’all know I’m a sucker for a no sew pillow cover. I’ve made them envelope style, from sweaters, faux fur, and in a bow. 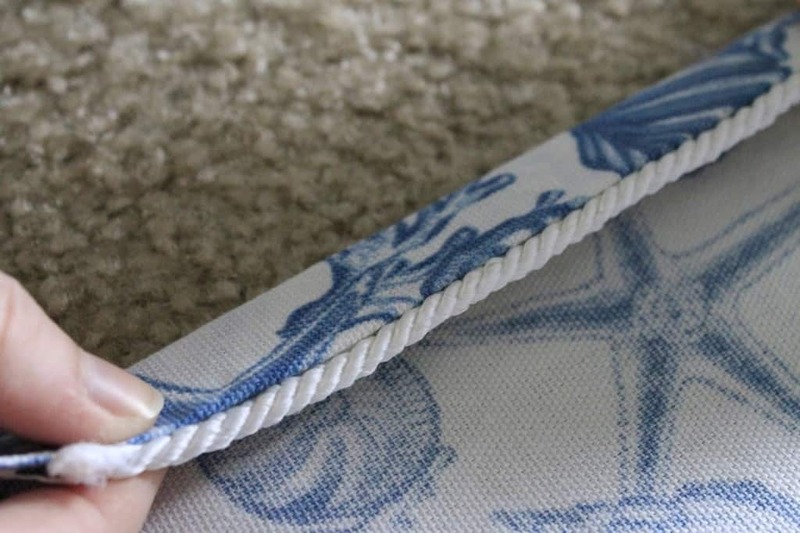 I was recently at Jo Ann’s and saw this awesome rope piping. I’m super obsessed with rope, too. So, it was a match made in heaven. 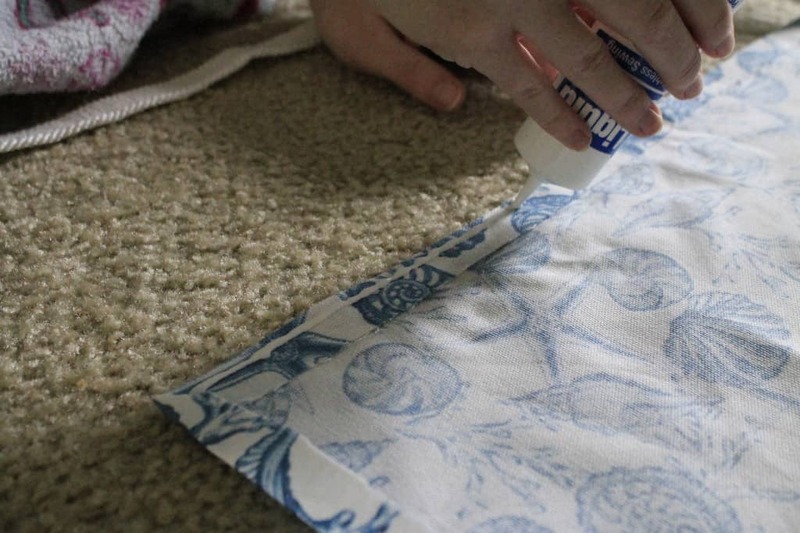 Here’s a tutorial for how I made a no sew pillow with piping. 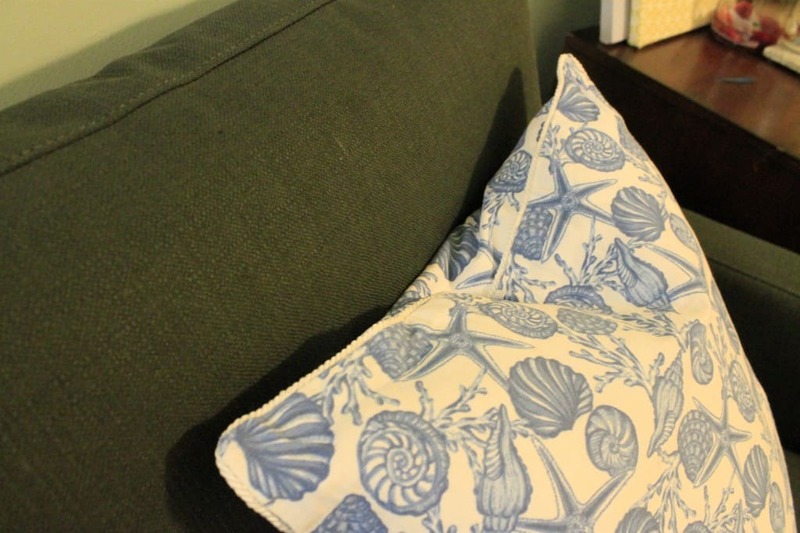 I’d never made a pillow with piping before but it turned out to be super easy. It helps if you start with a pillow with a cover. This one is from Homegoods. 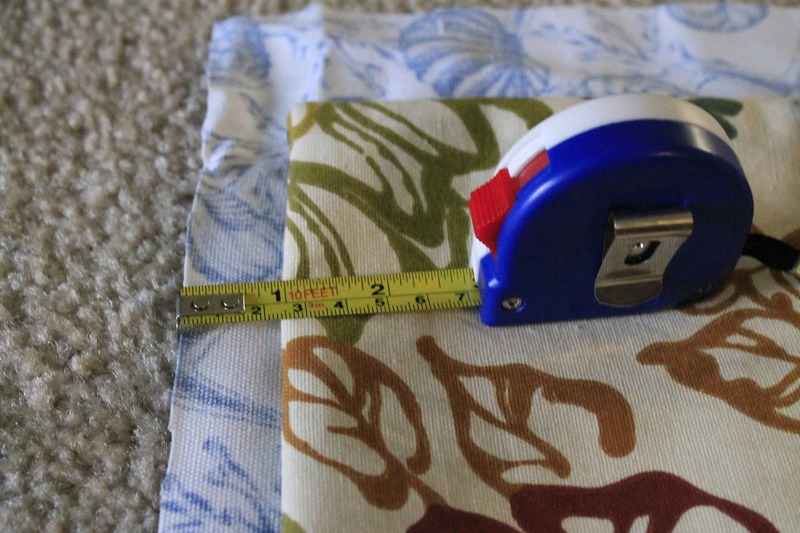 I took the cover off and used that to measure my fabric. 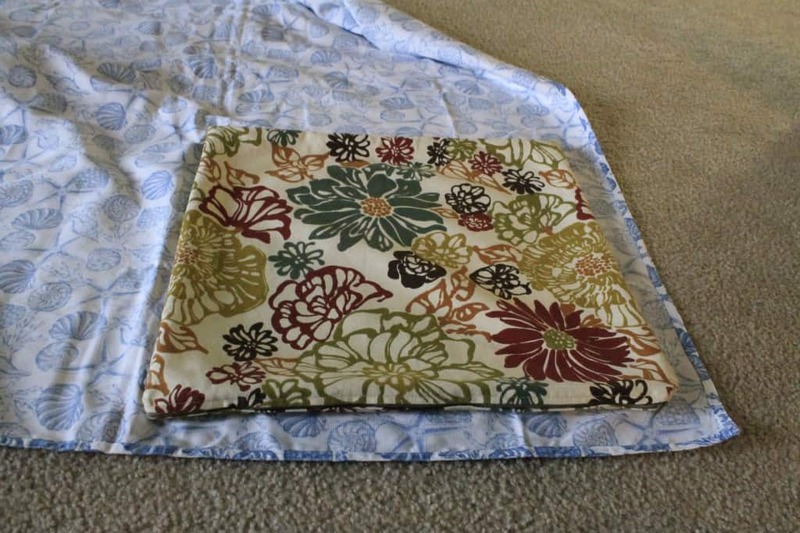 You need the size of your cover plus 1 inch in each direction except 2 inches on one side. So, add 2 inches to the length and 3 inches to the width. Cut out two pieces of fabric this size. My fabric is a table cloth. I cut off the hem. 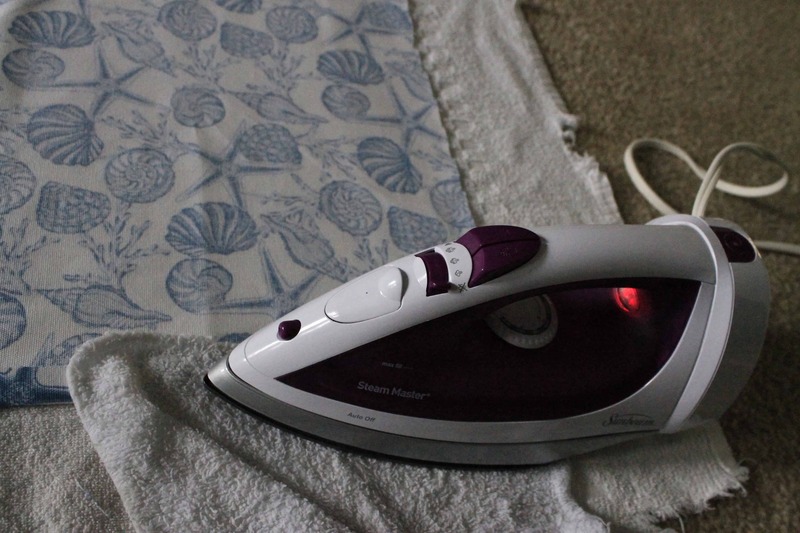 Iron the whole thing so it is nice and smooth. 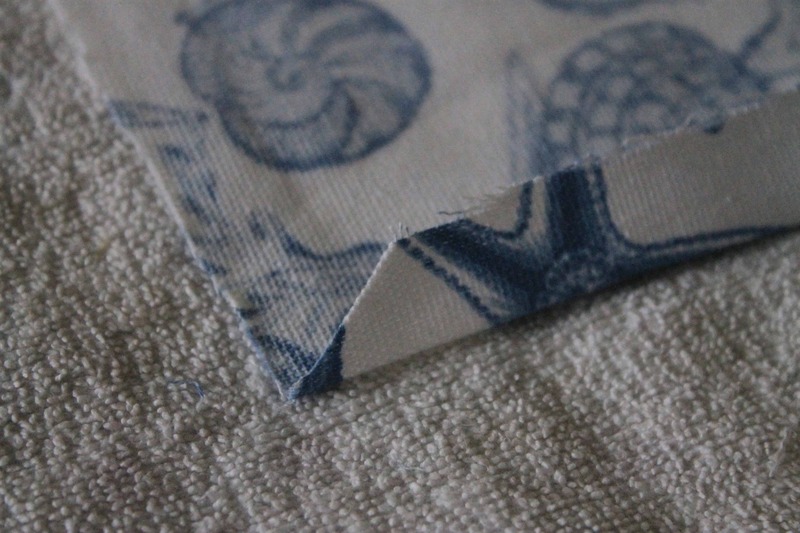 Now, iron a 1 inch hem crease around all 8 sides. 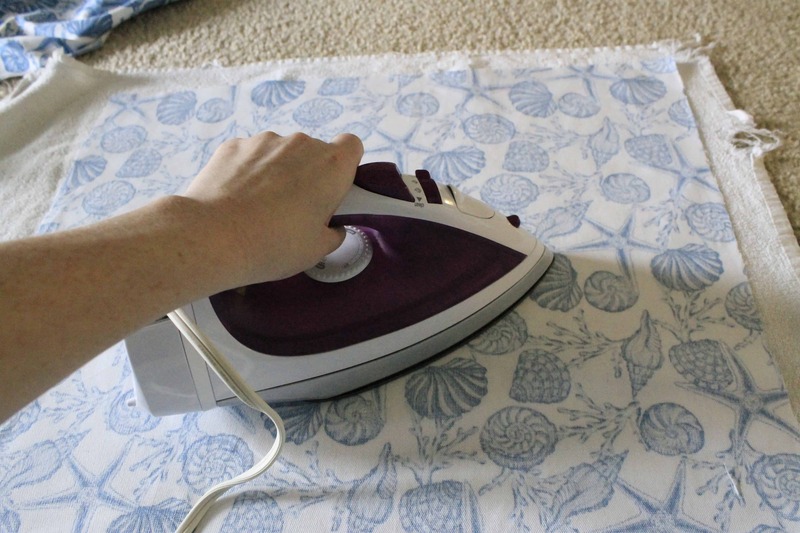 I have learned that its super awesomely helpful later to diagonal cut your ends of folds when you first iron them. 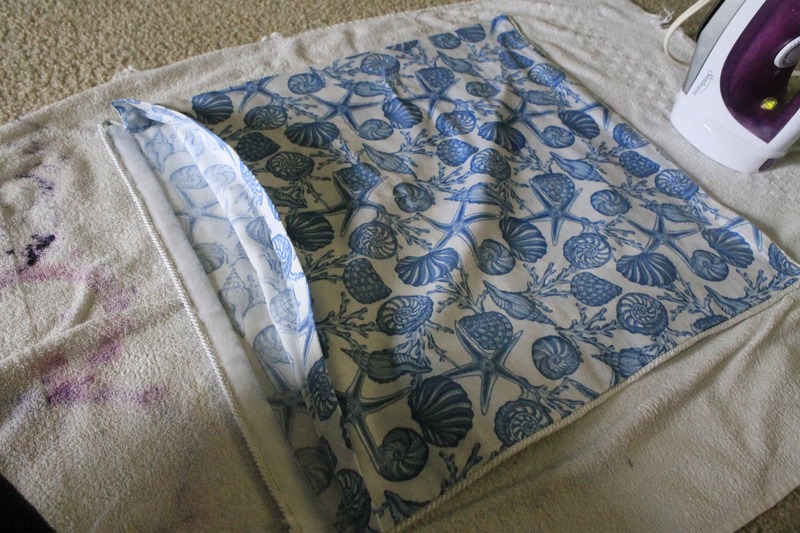 Now, on the side that you left the extra inch, use fusible hem tape to glue that flap down. 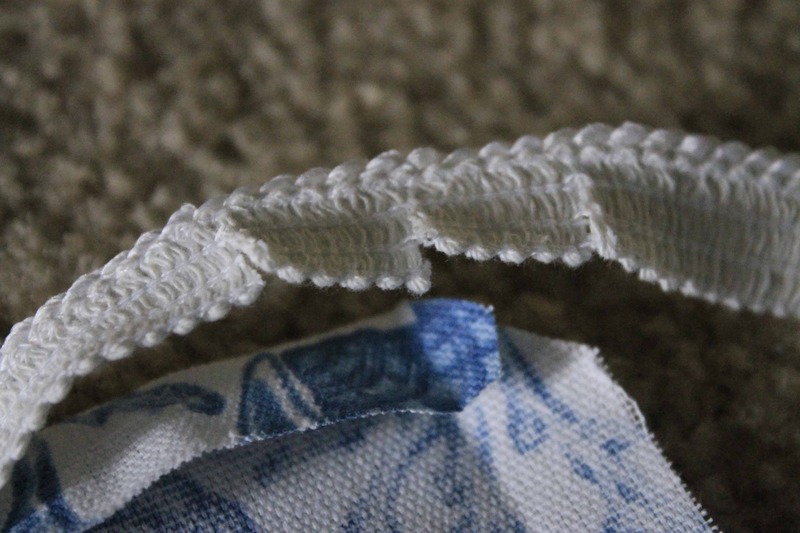 Follow the instructions on your hem tape. 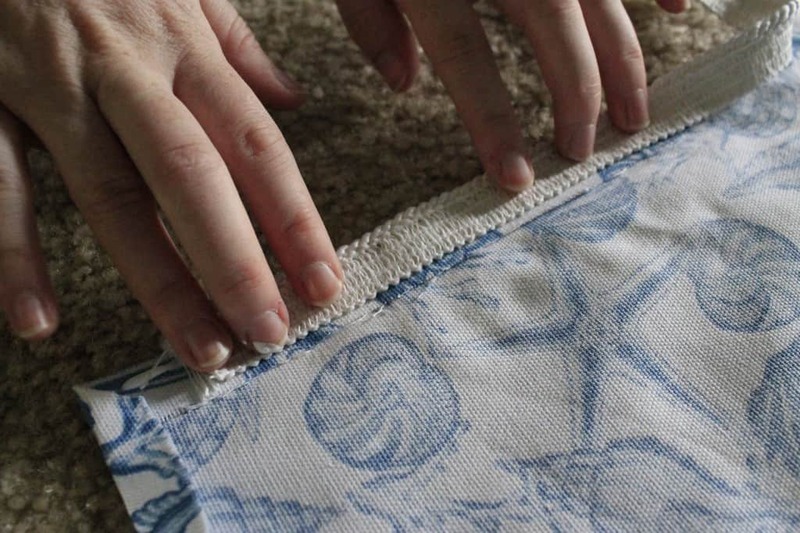 Do this on both pieces of fabric. Now is the time to add your piping. Start on a straight edge. 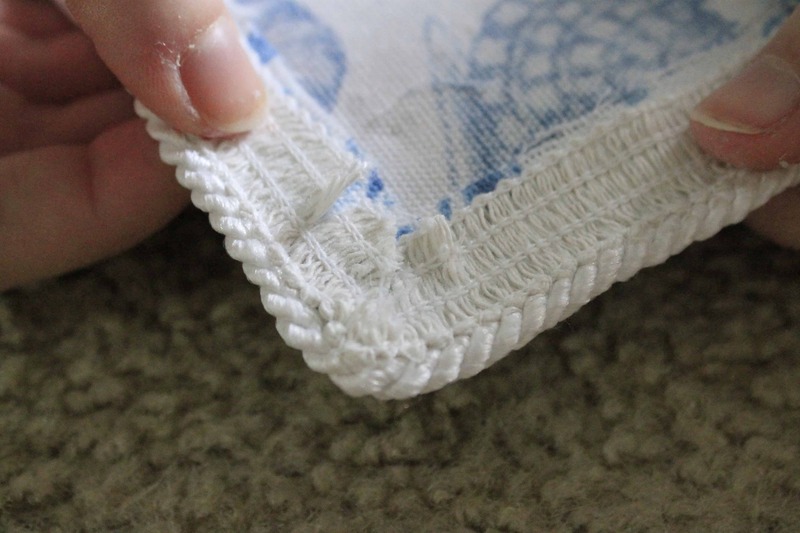 You want to use Stitch Witch no sew glue to glue the flat part of your piping to the edge of the good side of your fabric. Line it up so the piping pokes out just over the crease. The corners seem tricky but are not. Just cut slits in the flat part of the piping. It helped me to cut out some of the flat part. Then just glue as usual. Overlap the end of your piping a bit and use extra glue to hold it down. Allow to dry according to glue’s directions – mine said an hour. Meanwhile, attach your Velcro closing. 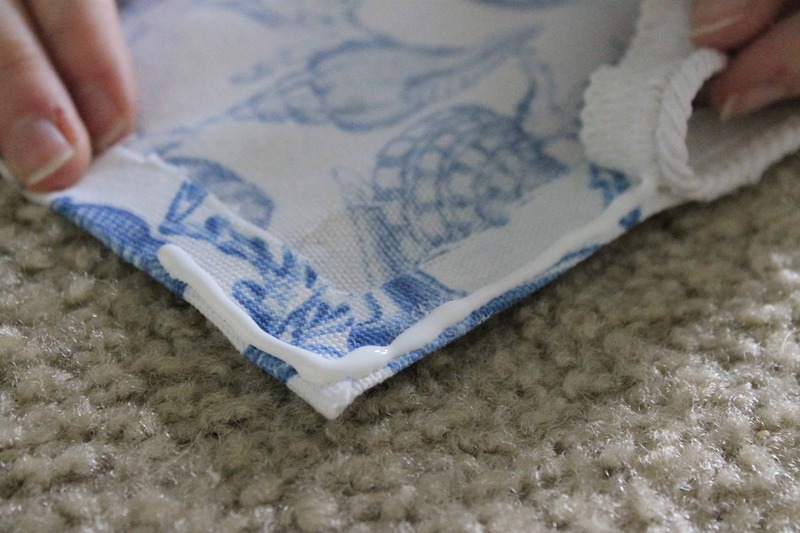 I like using Velcro better than the envelope style pillows, but you can use that method if you don’t have or like Velcro. 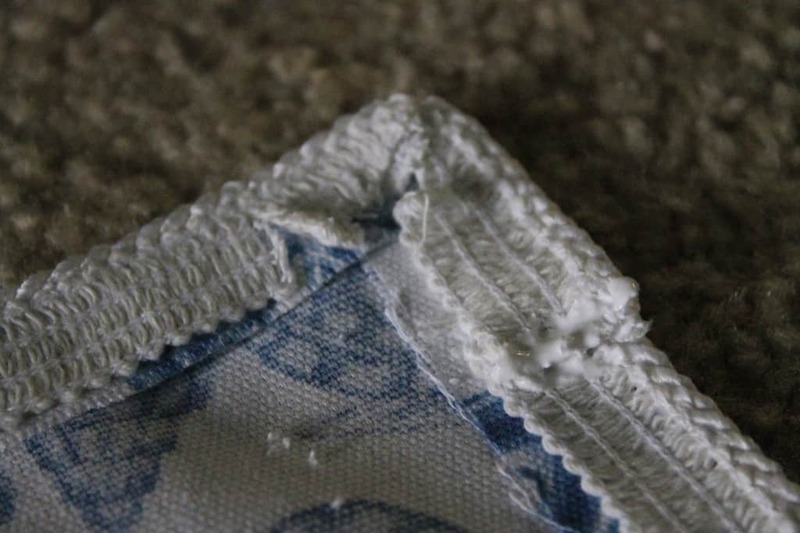 Glue Velcro to the 2 sides that you left an extra inch on and hemmed earlier. 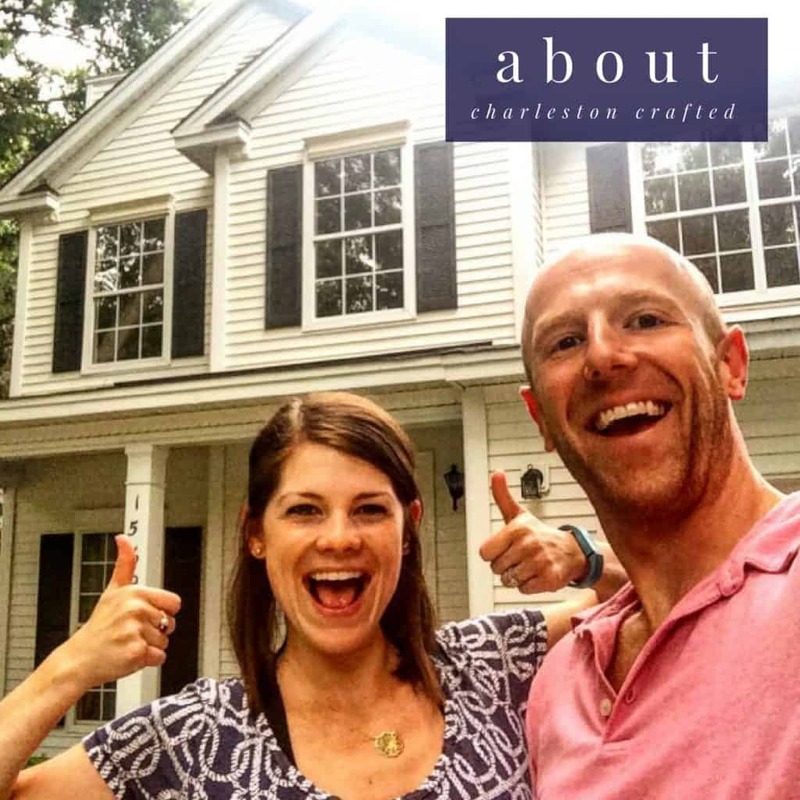 Make sure it is lined up correctly – it should be on the “good” side of one piece and “bad” side of the other. 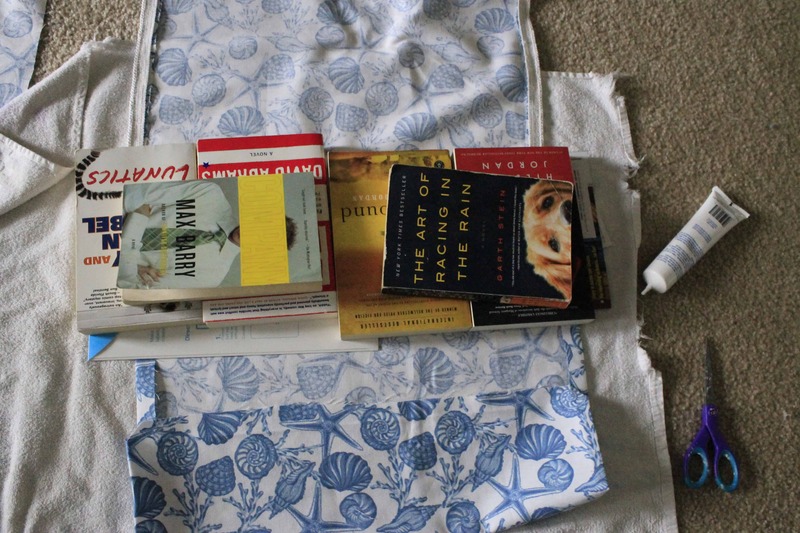 Place something heavy and flat on top (like books) and allow to dry completely. Then, attach the two sides. 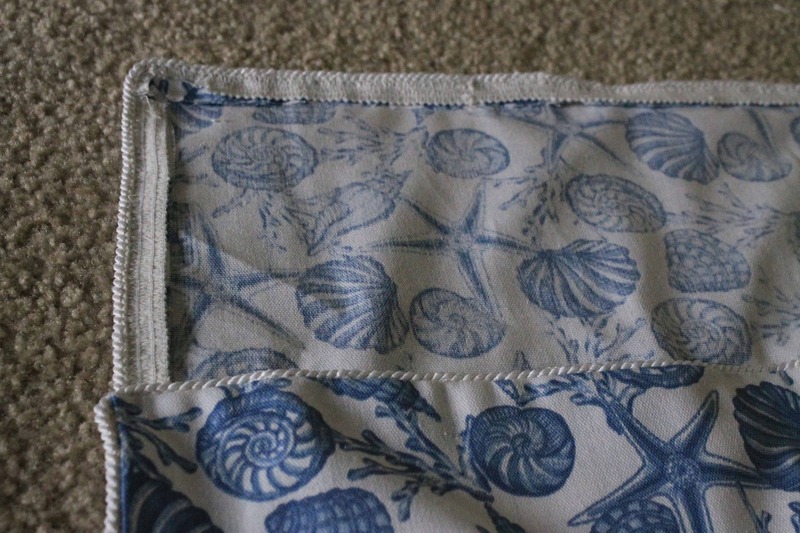 I laid the non-piped side on top of the piped side, with the hem tape in between. 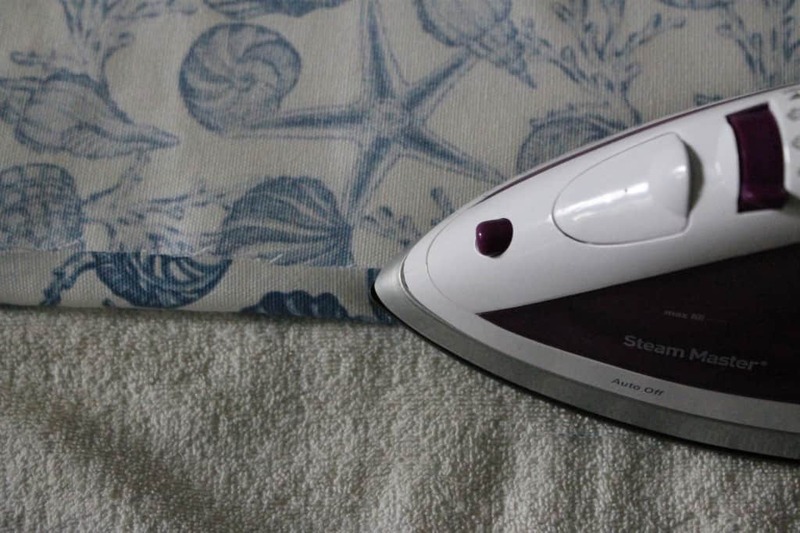 Iron to seal. It’s important to line the edge up right next to the piping for a flush finish. You should be attaching flap to flap, fabric-wise. 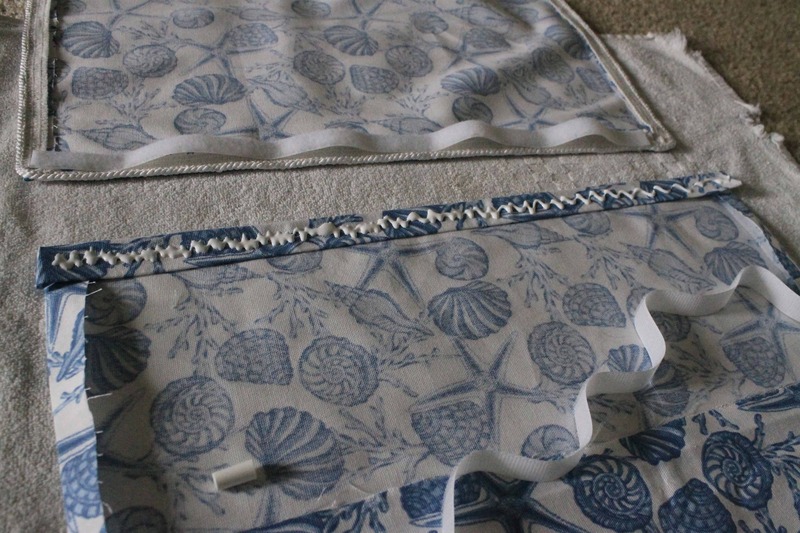 This way, you create one double fabric “sandwich” – flap, piping, flap. 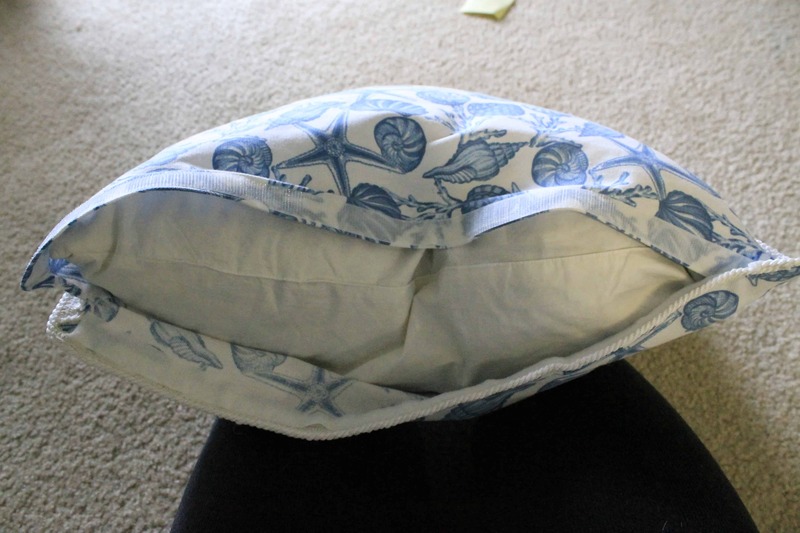 You can push this to the front or back so the pillow will go in all the way to the seam. 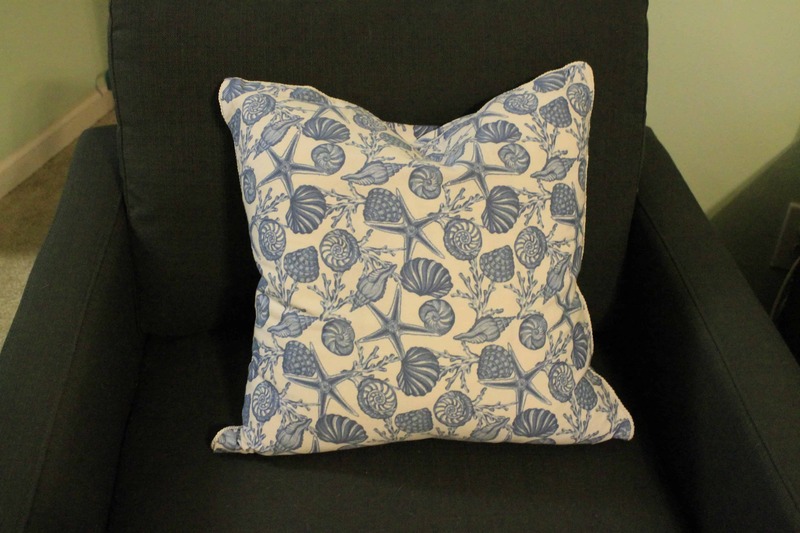 You should have a piped pillow cover now. Insert your pillow and enjoy! 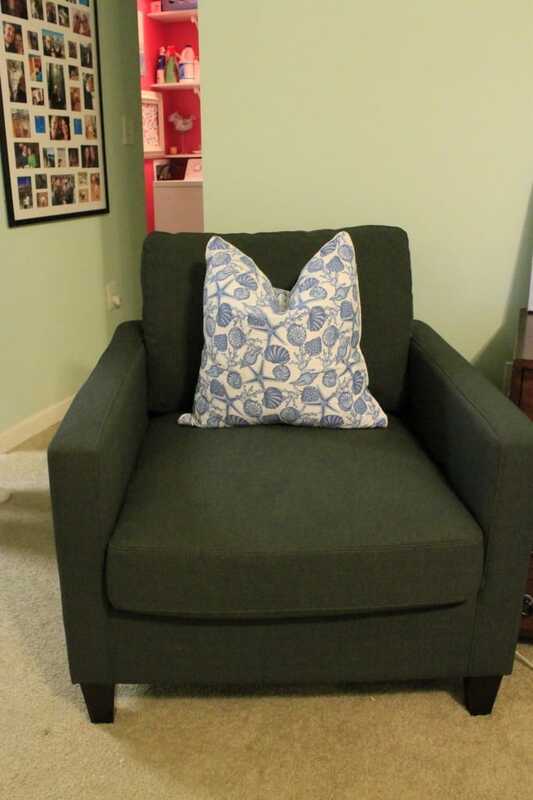 Note: for real y’all, I love this no sew stuff, but a 2014 goal of mine is to get on using my sewing machine! I’m having trouble getting it to work after years in the closet – if anyone is willing to help, please reach out!